who departed this life April 12th 1863. Aged 18 years. Repent in time make no delay, I in my prime was called away. 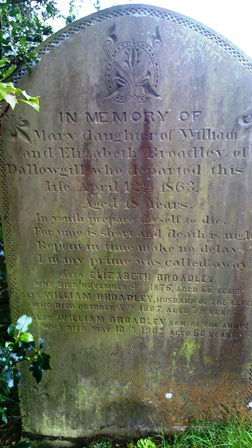 ALSO ELIZABETH BROADLEY WHO DIED NOVEMBER 4TH 1876 AGED 66 YEARS. WHO DIED OCTOBER 5TH 1887 AGED 79 YEARS.